If anything can entice shoppers to spend money, it’s free stuff (and deals). 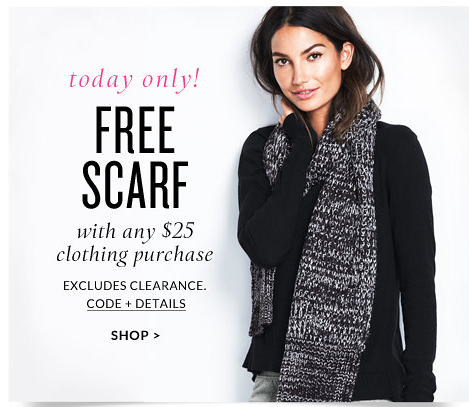 Today, at popular retailer Victoria’s Secret, customers who make any $25 clothing purchase will be eligible to receive a free scarf. Just add promo code “SCARF25” to your order at checkout to receive the black/gray/ivory marble scarf. Ensure that you have $25 of qualifying apparel items in your shopping bag, excluding clearance clothing. This offer is valid through 11:59 p.m. Pacific time Jan. 14, while supplies last. If your online shopping exceeds $25, keep in mind that Victoria’s Secret offers free shipping on orders of $100 (with code “FREESHIP100”). Get the scarf from Victoria’s Secret.